Dogs love to dig. 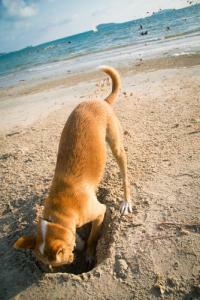 Whether burying a bone or digging for buried treasure, dogs certainly enjoy digging holes. You may not know it, but research finds that dogs are especially triggered to dig when around sandy surfaces, as can be seen in this picture. Anyone who has lived with a dog knows that digging is completely normal, but also that certain breeds will dig more often than others. For instance, long ago, terriers were bred to hunt underground prey and therefore are likely to try the same in your back yard. Similarly, community bankers are frequently found digging around for new customers. One of the hardest things is to find new untapped markets, so it certainly makes sense that bankers have to dig for them. One idea worth considering, perhaps, is to expand your bank's business footprint into nearby markets by opening a branch. We are aware that banks almost everywhere are shuttering branches as a result of rising operating costs and declining customer usage. Yet there may still be opportunities for banks to open new branches and make money if you really dig into the research and then execute a sound strategy. Illustrating the potential is a report by Ambassador Financial Group that looked at the growth opportunities for community banks that move into highly concentrated adjacent markets. Ambassador noted that when a handful of large banks compete in a market, the market is typically large and demographically attractive. If community banks play their cards right, they should be able to steal away a certain percentage of these big bank customers who would prefer to work with a smaller organization. In some cases, just one or two percentage points of market share in a new market can equal multiple years of growth in a bank's legacy market, according to the report. This said, banks must be certain they don't spread themselves too thin and that there is an adequate return on the added investment. Organic growth may exist and can offer opportunity, but with many markets already overbanked, the acquisition of a well-placed branch currently operated by a haphazard market player may offer the better opportunity. Banks are likely to find the best opportunities in markets that are densely populated and have a large number of small businesses. New branches will want to focus first on gathering assets and this is likely best achieved by building a talent pool of seasoned lending professionals already operating in the area. Once again look to the haphazard competitor who may have dissatisfied staff who know the market well. Should banks avoid adding branches because mobile and online banking are the preference for a growing number of transactions? That is one key consideration for sure, but it is interesting to note that despite the hullabaloo about technology changing the face of banking (and truly it is), brick-and-mortar branches are still the primary way banks deliver services to customers. Consider that even with the increased use of online and mobile banking, institutions operated 94,725 banking offices as of June 2014, down just 4.8% from the all-time high of 99,550 offices in 2009. What's more, according to the FDIC, visiting a teller remains the most common way for households to access their accounts. Like a dog trying to find a buried bone, banks should seek growth opportunities by continually digging around conventional wisdom. Perhaps opening a well-planned new branch may offer just that opportunity. Treasury yields slid 2bps with the 7Y auction seeing strong investor demand. Yields are unchanged ahead of GDP, scheduled for release later this morning. 1) Green Bank ($2.2B, TX) will acquire Patriot Bank ($1.4B, TX) for about $139mm in stock. 2) Bank SNB ($2.0B, OK) will acquire First Commercial Bank ($305mm, OK) for about $41.7mm in cash and equity or approximately 1.4x tangible book. 1) First National Bank of Pennsylvania ($16.1B, PA) will acquire 5 branches in PA from Bank of America for a 2.75% deposit premium ($7.7mm premium for about $280mm in deposits). A survey of major economists by the Wall Street Journal finds despite a weak Q1 GDP, 73% expect the Fed to start raising rates at the September meeting (5% predicted July and 3% saw October as the first date). Bank Director cites the director of bank and equity strategies for Vining Sparks as saying the median dividend yields paid by banks they follow are in the mid 2% yield range. Meanwhile, he also said 20 banks they follow are in the 2.8% to 3.0% yield range. The dividend yield is calculated as annual dividends per share / price per share and is intended to show how much return investors get for each dollar invested in the equity of the institution. A survey by CSBS finds 80% of bank executives surveyed say they are not planning to make an offer to acquire another bank in the next year. Census Bureau research finds 78% of all US businesses have no paid employees (mostly self employed operating unincorporated businesses). For small businesses with employees, it is interesting to note the data indicates those with 1 to 4 employees (61%); 5 to 9 (18%); 10 to 19 (11%); 20 to 99 (9%) and 100 to 499 (2%). Experts say M&A deals are getting frothy based on the fact that projected returns from the earn-back period on tangible book are reaching 5Ys in some cases. Investors are more used to a 3Y maximum, so concerns are mounting that deals will get more opposition from shareholders if this holds.